I know that poet and novelist Ian Wedde, now nearing 70, has long been a respected presence in NZ Lit. But as I have admitted before on this blog, I have only recently come to his work. I enjoyed reading and reviewing his novel The Viewing Platform, a deft satirical swipe at the cult of tourism, when it came out in 2006. More recently, on this blog I’ve reviewed his novel The Catastrophe (2011), which meshed First World gourmet lifestyles with the travails of Palestinians; and his most recent collection of poetry TheLifeguard (2013), which put specifically New Zealand landscapes and concerns into the imagistic context of cosmopolitan culture. On this very meagre sampling of his extensive output, I’m not sure how to categorise him – probably a good thing, as writers prefer not to be categorised. He’s a satirist. Sometimes the strange situations he puts characters in make him a surrealist. He’s a man of considerable life experience, looking with a certain dry irony at things that were once fashionable and things that still are. He knows a lot about art – art history and art curatorship are also part of his CV. And he is always concerned with how New Zealand culture relates to that of the rest of the world. All these elements have their place in his latest novel Trifecta, a trim piece of work structured as three separate narratives told by three siblings. Now all in their sixties, Mick, Veronica and Sandy (once, late in the novel, Sandy is called Alistair) are the three children of the German architect Martin Klepka, who fled Nazi Germany to settle in Wellington, where he worked producing modernist, post-Bauhaus-type houses. The fictitious Martin Klepka is clearly a wink at the world of the real Ernst Plischke, whose career followed a similar path but who otherwise had little in common with the novel’s character. At any rate, Klepka (like Plischke) was apparently one of those sophisticated refugee continental Europeans, who taught uncouth New Zealanders (especially in Wellington and Auckland) how to drink coffee and enjoy modernist art from the 1930s to the 1950s. Martin Klepka has been dead for about forty years. His three offspring live very separate lives. They don’t get on with each other, and there is a bone of contention concerning the Wellington house that Mick occupies on his own. This “red house” is considered by students of architecture to be some sort of modernist masterpiece. As such, it could be worth a lot of money. Mick narrates the first section. He is clearly a self-made larrikin; a man partly in revolt from the pretentious things that have been said about his father’s work. He is addicted to smoking and gambling on horses and generally bumming around. He has a highly cynical streak, fuelled by his knowledge that his architect father was a bit of a fraud, plagiarising other people’s design ideas. But then, as father’s favourite, he is aware that his father didn’t take himself as seriously as his admirers did, and was a contemptuous of high-falutin art theory as Mick is. Mick is therefore more than a little contemptuous of his academic brother Sandy, who lectures on modern art and architecture at the University of Auckland. Obviously Mike’s contempt is applied to a great part of the human race. It’s never my intention to spike the surprises of new novels, so I won’t go into how these three separate siblings are brought together in the novel’s final section, narrated by Sandy. What we do find in his narration, however, is somebody who at least confirms in part his brother’s and sister’s negative image of him, but who is far more vulnerable (and pitiable) than they suspect. His backstory involves betrayal in marriage, an affair in Germany that went nowhere, and divorce; but mainly the greyness of finding himself slipping down the academic ladder as his lecturing job at Auckland becomes more and more precarious and his hours get cut. Of course sibling rivalry is one concern of the novel – the way childhood resentments can continue well into adulthood. (Sandy still resents the fact that Mick was their father’s favourite, and Sandy’s immersion in the world of Bauhaus art could be read as an ongoing attempt to win his deceased father’s approval.) Of course ageing is another major concern – all the characters are past their prime and dimly aware that the art they grew up with and the cultural signposts they knew are fading away. And of course we can have fun talking about three “unreliable narrators”, knowing that none of the separate narratives of Mick, Veronica and Sandy is “objective” or definitive as a replication of reality, but the ensemble does give a roundedness to the novel’s characters. I might also note that any novel which has a conflict over a house with aesthetic qualities lives in the shadow of The Spoils of Poynton. What most strikes me about Trifecta, however, are its undertones and hints about the state of New Zealand culture now. Although the novel doesn’t labour the point or discuss it overtly, Sandy’s university is clearly now a neo-liberal institution where money and commerce rule over the humanities and therefore art is given low priority. Hence Sandy does not find the respect and security that an academic in the humanities might once have expected. The myth of High Art has untangled a bit in the age of post-post-modernism, and (for all the coffee-table books that are produced about them) modernist artists and architects no longer have the cachet they once had. Most of us would prefer to have a liveable house than a house that is a “work of art”; just as most of us would prefer to have chairs that can actually be sat on rather than neat, geometrical and uncomfortable Bauhaus chairs. Besides which, houses of the Plischke variety tend to be owned only by the very affluent, so willy-nilly they come to represent art as tradeable upper-middle-class commodity. And as people get older (Mick, Veronica, Sandy and you and me), they tend to be less awed by the art fashions that once seemed ground-breaking. Maybe I’m quite wrong to read these things into Trifecta. May this wasn’t what Ian Wedde was saying at all. But these are the things that this short novel makes me think about. Which could make me the fourth “unreliable narrator”. 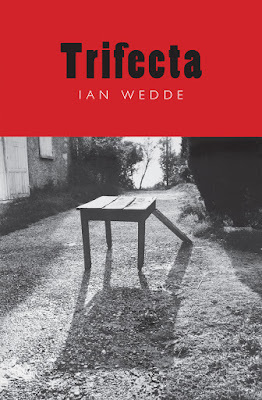 Sensible footnote: The cover photograph of Trifecta is “Table Leg”, taken by Bill Cuthbert in 1982. It shows a broken table with only three surviving legs, being propped up by a long piece of wood. This could have to do with the memory and inheritance of the long-dead Martin Klepka still propping up his three children. Or it could be a wry comment on unusable furniture. I really don’t know. Extremely silly and carping footnote: I am a little annoyed that twice in the novel, a tough-romantic German song that Brigitte Horney sang in the 1930s is called “So oder ist das Leben”. The correct title is “So oder so ist das Leben” (“Life’s either this thing or that”). A misprint maybe? Once upon a time there was an Anglican Archbishop of Canterbury, Edward White Benson, who had six children. None of his children ever married or had children of their own, which may have been just as well. A strain of melancholy-madness, or what might now be called severe bipolar disorder, ran through the family. On the other hand, as Kay Redfield Jamison has argued in Touched With Fire, manic-depression is often related to enhanced creativity, and four of the archbishop’s children were very creative. Two of the children died young. A daughter, Margaret Benson, became an Egyptologist. The fifth child was E.F. (Edward Frederic) Benson, best known now for his farcical Mapp and Lucia novels, written in the 1920s and 1930s and inhabiting the cheerful territory somewhere between P.G. Wodehouse and high camp. The sixth child, widely regarded as the most brilliant of the bunch, was Robert Hugh Benson, who converted to Catholicism, became a priest and wrote a series of historical novels, as well as the admired dystopian novel Lord of the World. Older than them, however, was A.C. (Arthur Christopher) Benson (1862-1925), a rather more dour and plodding chap than his younger brothers, but just as prolific in the production of books. His career was first as a schoolmaster at Eton and later as master of Magdalene College at Cambridge. Anglican and patriotic, he wrote the words to Elgar’s Pomp and Circumstance march Land of Hope and Glory. 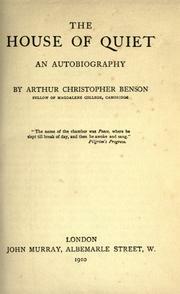 A.C. Benson’s bibliography runs to over 50 books – novels, poetry, belles-lettres and collections of essays. Because he was a single, celibate male, there has in recent decades been the predictable suggestion that he, like his single, celibate brothers, was homosexual by inclination. While this may be true, nobody has ever shown that the Benson brothers did anything other than live and die virgins – not even E.F. Benson, the most overtly camp of the siblings. (In my notice on A.J.A. Symons’ The Quest for Corvo, you will find comment on the possible, but unconsummated, relationship between Robert Hugh Benson and Frederick William Rolfe). Now why, you ask with mounting impatience, am I giving you all this biographical detail? Because I am once again about to follow my maddening habit of delivering you, in this “Something Old” section, comments on a book you have probably never heard of and will probably never read. Two of A.C. Benson’s books sit on my shelves. One is The Silent Isle, a large and rambling collection of observations, editorials and literary reviews. The other is The House of Quiet, first published in 1904 (not 1907, as Wikipedia erroneously claims, perhaps because Benson added a Preface in 1907 replying to critics). Immensely popular in its day, The House of Quiet went through seventeen printings between 1904 and the very battered 1912 copy I own. It kept selling well into the 1930s. Thereafter it fell out of favour and, like so many bestsellers, is now virtually forgotten. So for me, it is yet another excuse to comment on the ideas it had, which once appealed to a mass audience. Subtitled “An Autobiography”, The House of Quiet purports to be a diary, written in the 1890s by somebody who died in 1900. The question it claims to pose is whether somebody of no great public note, who makes no particular mark on the world, nevertheless contributes to life. The narrator (diarist) had a private tutor, then went to a public school, and was studying at Cambridge when he was told that he had a debilitating disease for which there was no cure. So he retires to the country to ponder on Life’s Great Mysteries. This, somewhat inevitably, is all premise, for Benson’s real purpose is a series of loosely-connected essays and observations. The narrator gives us tender memories of his mother’s untutored natural goodness; examples of his own “sense of beauty”; and accounts of the joy he got in childhood fishing expeditions on a millstream. He lectures on the folly of teaching schoolboys classical grammar instead of more robustly introducing them to the classics. He expresses a growing religious sense, but he has crises of what appears to be melancholia (deep depression – part of the Benson family curse). There is much detailed description of the natural world, often charming but equally often tipping over into purple prose, with Benson showing off words like “purpureal” and “ranunculus”. So, appropriately on a serene evening, the Englishman passes away through English countryside and into the arms of a loving God. Dimly I perceive a good idea here. A good life is not necessarily a life of great public achievement. It can be a quiet life of friendship, goodwill and real help to other people, simple pleasures and work. We don’t all have to win the first prize, build the great building, write the great book or score the winning try to general applause. Fair enough. Other people have expressed this philosophy convincingly. Alas, however, over this book hang the dreadful hands of complacency and wish-fulfilment. It is really escapism. Note that the diarist’s circumstances assume a large and settled income and the easy acquisition of a nice country home. Note that love arrives comfortably and without fuss (and is dealt with so briefly that it hardly ruffles the diarist’s feathers). Note there is no real commitment to another human being, and no anguish or real grief in the approach of death. And – goodness – it is all so English – not that there’s anything wrong with being English, except that in this context it takes for granted a huge cultural superiority. But such moments are few. The House of Quiet would have comforted or tickled some generations of well-bred English readers, who took going to church as both inevitable and worthy. With its rambling sequence of thoughts in a country setting it is in some respects, then, the Anglican and churchy counterpart to the agnostic George Gissing’s The Private Papers of HenryRyecroft. But it does not have Gissing’s pungency and variety of interest, and its views are even more dated. I cannot see it ever being “rediscovered” and regaining its bestseller status. It is 1970-something. We are all good students and we are protesting at the possibility that a sports team from Rhodesia might tour the country. Our anger is righteous. We know that under Ian Smith, Rhodesia, unilaterally declared independent, is a racially-segregated country. It is attempting to perpetuate the white supremacy of the colonial era, just as its neighbour South Africa is doing. So we are on the side of those who are fighting against the Smith regime. Joshua Nkomo, Robert Mugabe and others. If the true democratic will of the African people is unleashed, it can only be for the good. We got our wish – sort of. Rhodesia disappeared from the map. Smith and his regime vanished into history. 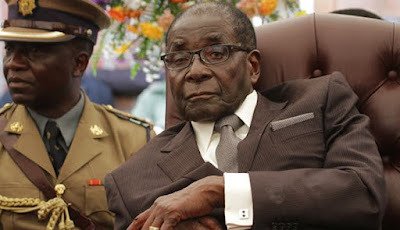 And for the best part of 30 years, Robert Mugabe has led the new state of Zimbabwe. Mugabe has driven it into the ground. He consolidated power by genocidal attacks on tribal enemies. He has destroyed the country’s chief asset – its farming – in the guise of nationalising it. Opposition parties are tolerated to a very limited extent, as Mugabe does go through the regular process of pretending to hold free elections – but then, when the opposition actually won an election, he had to rig things to keep them from power. Government goon squads beat up and intimidate any opposition figures who get too prominent. When he runs short of ideas (which is fairly constantly), Mugabe simply blames his country’s woes on its old colonial masters, who left long ago. Zimbabweans understand what a farce this is. The country’s currency is now worthless (inflation rates are much higher than those in the worst depths of Weimar Germany). Trade is by barter or by using foreign currencies that actually have some value (dollars, yuan etc.). The material standard of living for the country’s citizens is much, much lower than it was under Smith’s white supremacist regime. And human rights are ignored. Zimbabwe is a desperate and impoverished country ruled by an ageing megalomaniac. So – were we wrong to register our protest all those years ago? Were we, unknowingly, supporting something at least as bad as the thing we were protesting against? We can multiply this example by reading Martin Meredith’s The State of Africa. It is the woeful chronicle of all the failed states in Africa, dictatorships and kleptocracies, that have come into being in the fifty or sixty years since European colonial powers pulled out. In the wrong hands, the book could become ammunition for those who argue in favour of the old colonialism and who say Africans are not capable of ruling themselves. Meredith definitely does not hold this view, but the story of modern Africa is in part the story of good liberal hopes thwarted, betrayed and destroyed with – in country after country – populations poorer and more degraded than they were under the old regimes. We can move the argument to another continent. When the Korean War was fought in the early 1950s, it was fought in Cold War terms. The US and its allies saw themselves as defending the south from Communist aggression (especially when China poured troops in to occupy the north). Left-wingers pointed out that Syngman Rhee, the leader of the south, which the US supported, had slaughtered many civilians to keep himself in power. There were many upheavals in the south (a failed students’ “revolution” with much bloodshed; a military coup and assassinations) before something resembling a functioning democracy emerged. So many left-wingers in the west supported the north in the conflict and believed themselves to be opposing aggressive Western imperialism. Flash forward half a century. Geographically smaller South Korea (population c.51 million) is a prosperous functioning multi-party democracy, with one of the world’s highest standards of living. Geographically larger North Korea (estimated population about 24 million) is a closed, impoverished, paranoid totalitarian state, different even from those other surviving “communist” countries in its rigid Stalinism, the cult of personality that surrounds its leader Kim Il-Sung and the complete subservience of its people to their overlord. It cannot feed itself and has suffered famine for which it has had to receive international relief, although its leadership never mentioned this fact in its state-controlled media. So, were those old lefties in the early 1950s wrong when they criticised Western policy during the Korean War? I could at this point get side-tracked on the issue of the great delusion that Communism was to many in the West in the mid-twentieth century, but I will stick with my subject. My point is – do we point to the judgements that people once made and say they were morally wrong in the light of subsequent history? Were we wrong to protest against a white-supremacist regime? Were people wrong to side against American policies in the Korean War? We simply cannot know how exactly the future will develop, and any political judgements have to be seen in the context of their own times and what was knowable in those times. Do we judge the moral rightness or wrongness of things simply by outcomes? Despite the rise of relativist morality, despite feeble arguments against “moral realism”, some things are intrinsically wrong and others are intrinsically right. Yes, we should think carefully about consequences, but it is simply beyond human capacity to read the future accurately or to foresee all consequences of current events and situations. White supremacism was (and is) an evil. A dictator who slaughters his own citizens was (and is) an evil. 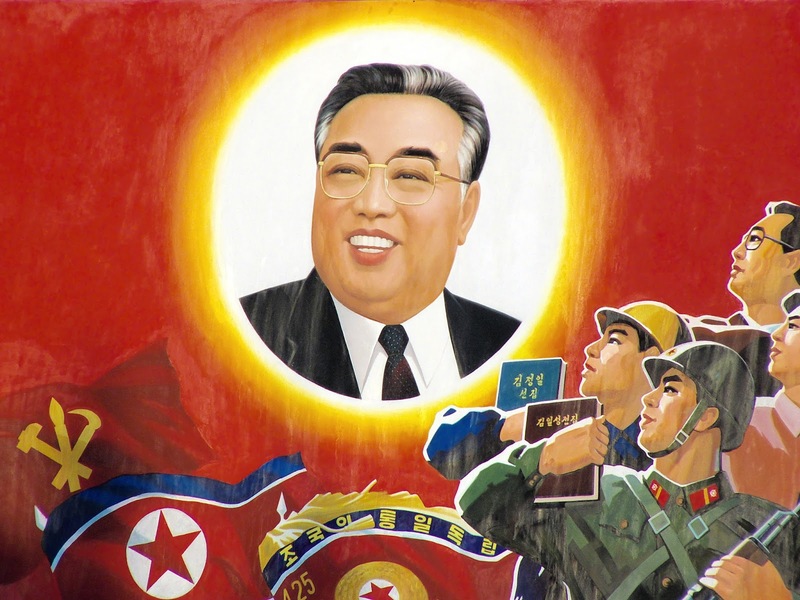 It was morally right to protest against these things, just as it is morally right now to deplore the regimes of Robert Mugabe and Kim Il-Sung. There are three photographs in Angela McCarthy’s Migration, Ethnicity and Madness which I find quite haunting and a little disturbing. The first is the cover photograph, reproduced in sepia tones. It shows fourteen women, apparently dressed identically, standing on a lawn in front of what looks like a baronial palace. Their long white skirts make them resemble dolls. It could be something created by a surrealist photographer. In fact, it is a photograph, taken some time around 1900, of the female nursing staff of Dunedin’s Seacliff lunatic asylum. The second (on p.67) reproduces a page from the doctor’s casebook of a woman incarcerated in the asylum in 1898. She believed herself to be a prophetess communing with God. The document includes a small photograph of her looking heavenwards with her arms upraised, obviously caught in the act of being a prophetess. One wonders what torments flooded her mind. But the third is to me the most shocking. On p.31 there is a photo of the old Dunedin lunatic asylum, built in 1863 and then superseded in 1879 by the palatial-looking Seacliff. Not only does the old asylum of the 1860s look grim and barrack-like, but it is also large enough to make you wonder that there were so many certified lunatics in the very small town that colonial Dunedin was at that time. Definitions of madness have changed. Perhaps some of the people who spent time there suffered from ailments that would no longer lead to their being institutionalised. Even so, it is a surprisingly large institution for such a small community. And Seacliff, consciously designed by its architect in a grand Scottish style, was much larger. 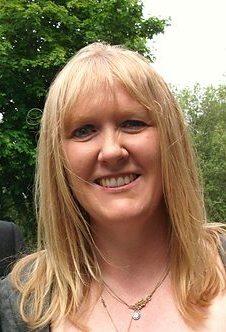 Angela McCarthy is Professor of Scottish and Irish History at the University of Otago. Most of her work has centred on patterns of Scots and Irish migration to New Zealand in the nineteenth century. Migration, Ethnicity and Madness is a book about those immigrants, between 1860 and 1910, who spent time in New Zealand lunatic asylums. In a way, then, its story of madness is a sub-set of the story of migration. McCarthy wants “studies of madness to be located within diasporic, transnational and comparative frameworks” (p.8) – in other words, she is concerned with how ethnic groups of the mentally-afflicted (Scots, Irish and others) interacted with their wider migrant ethnic community; with how doctors and superintendents in New Zealand exchanged ideas with those overseas; and with how the treatment of the mentally-ill in New Zealand compared with British, Australian and other experience. 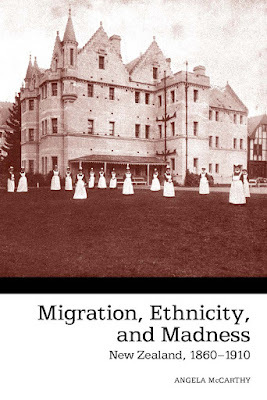 Migration, Ethnicity and Madness is the product of much research in British and New Zealand archives and in the surviving records of mental hospitals and psychiatric institutions. But the core research materials are the casebooks that were kept at Seacliff, many of them written by Frederic Truby King, medical superintendent of the asylum from 1889 to 1921. These casebooks comment on the origin of each patient, the supposed causes of the mental affliction, and sometimes the family history. They record the patient’s self-image, but also his or her ethnicity and background. After first considering the different legislation that covered lunatic asylums in England, Ireland, Scotland and New Zealand, and the way patients were admitted and discharged (Chapter 1), McCarthy moves on in Chapters 2 and 3 to the constant fear that lunatics were being deliberately shipped to the colonies to prevent their being a financial burden on British parishes. There is indeed some evidence of this, and also of families getting rid of insane relatives by shoving them across the globe. “Physicians…. suspected families of sending insane relatives abroad during lucid intervals.” (p.87) Colonial New Zealand immigration officials worried that people with hereditary diseases were slipping into the country. There was the constant puzzle of why the Irish were so over-represented among the certified insane. And every so often schemes would be mooted to repatriate undesirables back to Britain. Some speculated that the long voyage out to New Zealand exacerbated insanity among the unstable, what with sunstroke, homesickness, loneliness or the death of a child. While separation from family and homeland may have caused some depression and instability, it has to be noted that other mental patients arrived in New Zealand with family and with a network of connections. Indeed, McCarthy is sometimes at pains to contradict Miles Fairburn’s “atomisation” theory of New Zealand colonial society by noting (Chapter 4) that insanity often flourished in a family context in New Zealand, and that members of a patient’s immediate family were often recorded as the patient’s most frequent visitors. In Britain there were, consistently, more women than men in insane asylums; whereas in New Zealand there were more men than women. There is no mystery about this, however, as the gender imbalance in New Zealand hospitals reflected the gender imbalance in New Zealand as a whole at that time. After dealing with the “transnational ties to home” (chap.5), both in doctors’ professional connections with overseas colleagues, and in patients who pined for Britain, McCarthy turns, in her last chapter, to those matters most closely connected with ethnicity. Despite the widespread “scientific racism” of the age, and despite the fact that British asylums were racially segregated, New Zealand asylums were open to all races. Nevertheless, New Zealand doctors were still very likely to interpret damaged mental conditions in terms of ethnicity and culture. McCarthy finds in doctors’ notes and casebooks frequent references to race when doctors are diagnosing Irish or Chinese or Scots patients. There were comments on the food-choices of non-English patients and an assumption that the cultural background has aggravated a mental condition. No such ethnic notes are ever made about English or Australian patients. They are, in effect, assumed to be the “norm” of humanity. It is clear that occasionally there were racially- and ethnically-based tensions between patients, with examples given of Pakeha violence against Chinese, clashes between Maori and Pakeha, and some clashes between Catholic and Protestant. However, McCarthy’s conclusion suggests that the worst thing New Zealand asylums did to non-English patients was to judge them as if their culture itself was a mental aberration. Migration, Ethnicity and Madness is the first book-length study of this New Zealand topic and adds nuance to our history. It is only fair to warn, however, that this is an academic study and not light reading. It is concerned to verify and cross-reference information, and while lively anecdotes do appear (often in the quoted casebooks) they are not the book’s focus. One thing I applaud heartily – the decision to present added information in footnotes rather than endnotes. It makes it much easier to check sources and related material. If you look up George Gissing, you will find that previously on this blog I have dealt with three of the late-Victorian’s social realist novels – New Grub Street (1891), Born in Exile (1892) and the posthumously-published Will Warburton (1905). 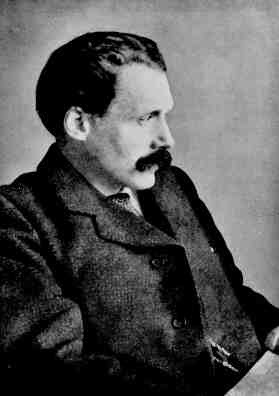 On the whole, the novels of Gissing (1857-1903) are grim and unforgiving. 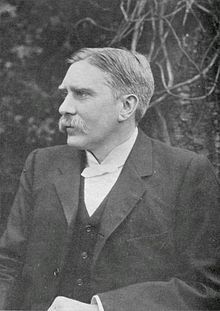 Though often embraced by Marxist and left-wing critics for his accounts of oppressed working-class and lower-middle-class lives, Gissing was no socialist. Indeed, more than once in his novels there is a sense of disgust that he has had to spend much of his life rubbing shoulders with the lower orders. And – because of specific events in his own formation – there is often a strong mood of frustration that he, a man with a university education, has never been able to claim his true place in the world as an academic intellectual. Gissing was mired in the real New Grub Street of having to crank out three-decker novels on demand for publishers. But, like so many struggling literary people, Gissing had a fantasy life. In it, he was a gentleman of leisure, living in pleasant bucolic surroundings, with nothing to do but take country walks, re-read his favourite books and keep a reflective diary. It is this fantasy that is the basis of The Private Papers of Henry Ryecroft. First published in the year of Gissing’s death, it was once his most popular book. The first copy of The Private Papers of Henry Ryecroft that I owned was printed in 1914. I gave it away to a bibliophile brother. The copy that now sits on my shelf was printed in 1915. The back of the title page informs me that it had already gone through seventeen re-printings in the 13 years since its first publication. Because of its dated attitudes – and perhaps because of its artificiality - The Private Papers of Henry Ryecroft has sunk in public esteem since then. (New Grub Street and The Nether World now tend to be regarded as Gissing’s best work). Even so, book lovers still like it for its pithy observations on literature in general and the love of books in particular. I remember the late craft-printer Ronald Holloway often pulling out a copy, when I visited him, to read out favourite passages. He was particularly enamoured of the section (“Spring” Parts XII-XIV) in which Gissing speaks of the joy of finding old books, smelling their particular odours and so forth. 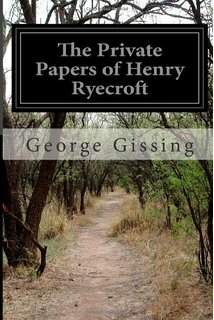 The Private Papers of Henry Ryecroft was written when Gissing was in his mid-forties. Henry Ryecroft – transparently a projection of Gissing himself – is a retired and widowed literary gentleman in his mid-fifties, living on an annuity in a country cottage in Devon. The book, divided neatly into the four seasons, gives his reflections over one year as he takes his walks, observes the country flora and fauna, remembers his youth, boastfully drops in the odd Greek or Latin tag and reflects on his favourite books. It would all seem very smug if the memories of garret-living city poverty in London did not seem so genuine. This reflective man has earned his rest. Even so, much of this book is irredeemably of its age. Gissing’s “Ryecroft” will, for example, deplore English cookery, the degeneration of English inns and of English sexual morality, with a “decline of conventional religion, free discussion of the old moral standards; therewith, a growth of materialism which favours every anarchic tendency.” (“Winter” Part XXI). But at the same time Ryecroft drops sufficient comments to suggest that English food is the best in Europe and English civilization the only criterion by which to measure other lands. He will say that English farm labourers and working men have sterling qualities; but also advise us repeatedly that he is not “democratic” and can see nothing genuinely creative in the lower orders. “Agriculture is one of the most exhausting forms of toil, and, in itself, by no means conducive to spiritual development”, he remarks. (“Autumn” Part XVII). [This observation reminds me of Nathaniel Hawthorne’s comment on farming, in The Blithedate Romance, that “intellectual activity is incompatible with any large amount of bodily exercise.”] Ryecroft, after all, has known the labouring poor at close quarters and they are not thinking creatures like “us”. He will speak with broad disparagement of mysticism and spiritualism, suggest that Positivism might at least wipe out the religious impulse – and yet still tells us how much he loathes and fears “science”. The book’s initial huge popularity in England is fully understandable, as parts of it so closely reflect the feelings and prejudices of its early 20th century English middle-class readers. At its heart there seems a dreadful sadness – I would almost call it hollowness. Ryecroft’s life is so solitary. All his reflections relate to himself. Nobody shares his house but a complacent housekeeper and he congratulates himself at one stage for the tranquillity he has found. Surely it is the tranquillity of disengagement. Repeatedly he implies that his soothing impressions of the countryside, or of the re-reading of his favourite books by the fireside, are his only hopes before death claims him. As a New Zealander who has made only a few visits to England – and then not to Devon – I can’t help finding alien much of the landscape that Ryecroft describes. I simply do not “get” many of the prose-pictures he paints of English vegetation and foliage, whose names are merely names to me. On the other hand, there is a certain poignancy in reading a book published a decade before the First World War which speaks so angrily against conscription and predicts that science will create bigger and bloodier wars. In the end, like so many books of reflections, this one can best be mined for its individual self-revelations. “Nothing is more rooted in my mind than the vast distinction between the individual and the class. Take a man by himself and there is generally some reason to be found in him, some disposition for good; mass him with his fellows in the social organism, and ten to one he becomes a blatant creature, without a thought of his own, ready for any evil to which contagion prompts him. It is because nations tend to baseness and stupidity that mankind moves so slowly; it is because individuals have a capacity for better things that it moves at all.” (“Spring” Part XVI). “Persistent prophecy is a familiar way of assuring the event.” (“Summer” Part VII). “Even in its normal condition (if I can determine what that is) my mind is obviously the slave of trivial accidents; I eat something that disagrees with me, and of a sudden the whole aspect of life is changed; this impulse has lost its force, and another which before I should not for a moment have entertained, is all-powerful over me. In short, I know just as little about myself as I do about the Eternal essence; and I have a haunting suspicion that I may be a mere automaton, my every thought and act due to some power which uses and deceives me.” (“Autumn” Part XIV). “So far am I from feeling satisfied with any explanation, scientific or other, of myself and of the world about me, that not a day goes by but I fall a-marvelling before the mystery of the universe. To trumpet the triumph of human knowledge seems to me worse than childishness; now, as of old, we know but one thing – that we know nothing.” (“Autumn” Part IX). “There can be no home without the sense of permanence, and without home there is no civilization – as England will discover when the greater part of her population have become flat-inhabiting nomads.” (“Winter” Part XXI). And perhaps as New Zealand is now discovering.